There's nothing groundbreaking about the technology included in Naim's new $22,400, two-box, remote-controllable, top-of-the-line NAC 552 preamplifier. Still, the inclusion of two sets of RCA input jacks is a departure from Naim's tradition of DIN jacks, and the NAC 552's programmability is unusual for a high-end two-channel audio product. And you can order RCA output jacks at no extra cost, which is how my review sample was configured. I've spent six-odd years in a sort of hi-fi counterculture, playing with things like mono cartridges, one-box CD players, and cheap, homemade cables—and, of course, owning and listening to single-ended triode (SET) amplifiers and horn loudspeakers. But before all that, I owned components that, while more mainstream, did the job just as well in certain ways. That category included solid-state electronics (Naim, BEL, Spectral), dynamic loudspeakers of middling efficiency (ProAc, Epos, Magneplanar), electrostatic loudspeakers of very low efficiency (Stax), and even "high-end" accessories like Tiptoes and Shun Mook Mpingo discs (which I still have, although my five-year-old daughter has more or less permanently co-opted the latter for playtime use). Modern hi-fi is little more than a way of getting electricity to pretend that it's music. Of course, good source components remain all-important, and even if loudspeakers are imperfect, most of us can find one or two that suit our tastes, if not our rooms and the rest of our gear. Recording artists can reinvent themselves by crossing over into another style of music. Gloria Estefan, who started with Latin music, crossed over into mainstream pop with great success. Doug Sax, who reinvented the direct-to-vinyl disc and produced outstanding LPs for Sheffield Lab, eventually transferred all of his music to compact discs. Ivor Tiefenbrun, designer of the Linn Sondek turntable, now makes CD players. It's not every Consumer Electronics Show that someone introduces a $29,000 solid-state phono preamplifier—and I miss it. The 2002 CES was one. My show report in the April issue made it seem as if I'd found out about it there, but the fact is, someone clued me in after I'd returned home. I needed to come clean on that. With whom are you most intimate? Your wife? Husband? Your modern-times Significant Other? Your pet? Or, like a lot of audiophiles, is it your audio system? Do you nitpick and tweak it as if it were your pet? The Boulder 1012's is a line-level preamplifier and DAC in one box. Its design and build qualities are icons to elegant engineering know-how. No screws show on the rectangular box of large but not massive proportions, for example, which is all done up in matte aluminum and set off with a few highly polished stainless-steel buttons. The chassis construction uses tongue-and-groove techniques. The sides of the 1012 benefit from styling cues found on Boulder's newer amplifiers. As you can see from the photograph, the look is both elegant and hi-tech in a way very few other manufacturers manage. Sony describes the $700 TA-P9000ES as "a pure audio multichannel preamplifier equipped with two inputs for 5.1 analog multichannel audio sources, enabling selection, volume control, and amplification." 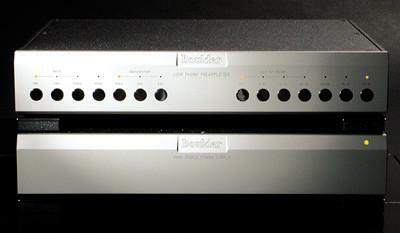 A relay with twin gold-plated crossbars switches the two six-channel sources. Then follows a class-A solid-state push-pull amplifier in discrete configuration. Separate transistors, resistors, and capacitors populate the printed circuit boards. An oxygen-free copper shield surrounds each channel to prevent crosstalk between the channels. 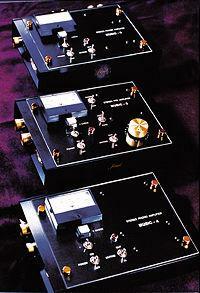 In addition, there is a relay-controlled gain stage offering 0, +6, and +12dB amplification. I anticipated the installation of the TacT Audio RCS 2.0 room-correction processor with mixed emotions—I already liked my system and room, and such a device threatened to make all my studied efforts trivial. What if one might use any decent amps and speakers, cables that were merely conductive, and no room treatment at all? And what if, on top of that, you could just put them wherever your significant other thought they looked right? What if all the magic you needed was contained in this box? Scary. Few topics will get audiophiles into an argument more readily than a discussion of the relative merits of tubed and solid-state equipment. A poll on the Stereophile website showed 53% of respondents choosing solid-state as their preferred amplifier design, while 38% indicated a preference for tubes—the remainder choosing "other," which presumably means digital amplifiers. (There has been no corresponding survey regarding preamplifier designs.) Opinions tend toward the dogmatic, with one respondent declaring "solid-state is more accurate," another stating unequivocally that "tubes sound closer to the real thing." 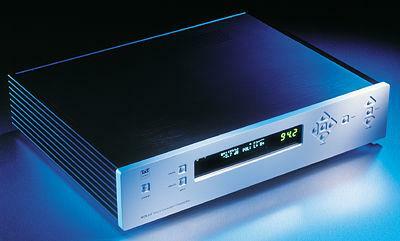 I've always wanted to review one of Madrigal's Mark Levinson products, and finally my prayers have been answered. The chosen victim? The No.32 Reference preamplifier. Note that "Reference" moniker. 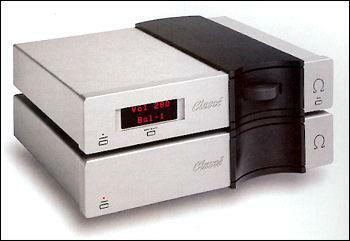 The No.32 is the first Mark Levinson preamplifier to carry such appellation. They're not kidding. One room at the 1999 CES in Las Vegas that knocked me for a loop was the Avalon/Classé installation mentioned in my April show report. Classé had just debuted the Omega preamp, the companion piece to the Omega amplifier I reviewed in March. It proved a very suave, musical, and high-performance marriage. Adcom is one of those companies that's just too consistent for its own good. Year after year, they put out well-engineered, fairly priced gear, while we audiophiles become jaded and almost forget they're there... You want a good-sounding CD player that doesn't cost an arm and a leg? [Yawn.] Well, you could try Adcom. Need a power amplifier with some sock that won't make your tweeters crawl down your ear? There's always Adcom. I first saw and heard SimAudio's Moon amp and preamp at WCES two years back, and something about their aesthetics appealed to me: Canadian ruggedness coupled with a decidedly French panache. I remember that those attributes also characterized the demo's sound, although I can't recall the speakers or the sources involved. At succeeding shows, it gradually dawned on me that the Moon components were the fixed elements in a succession of impressive demos. Tone controls? I ripped them out of my Dyna PAS-3! And that was the last time I had tone controls. As a card-carrying audiophile, I wanted just what the engineer had inscribed on the recording, with as little change as possible (read: high fidelity).